I Showed Up! Now Give Me My TROPHY! We’ve all seen it before, the end of the sports season when the trophies are given out for the 1st, 2nd, and 3rd place teams. 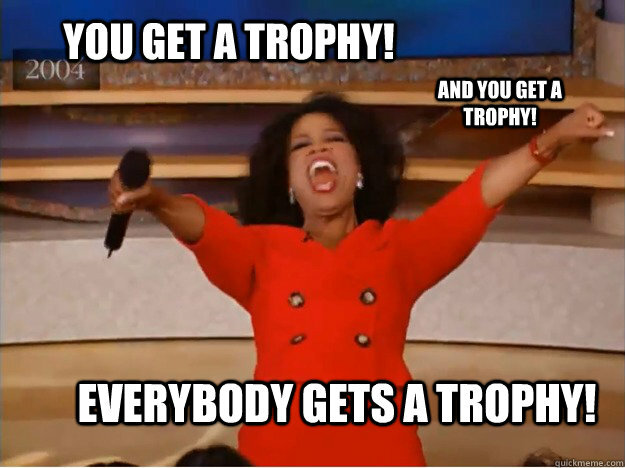 After those well-earned rewards are handed out, we know what’s coming- the “Participation Trophies.” Who decided this was a good idea and why do we keep doing it? The reason spouted most is that participation trophies raise a young child’s self-esteem and makes everyone feel included. As kind-hearted as this gesture is, it doesn’t provide any real-world life skills to our children. This overprotective approach to “growing up” created a generation of kids who can’t cope… with anything. This subtle form of political correctness is dramatically and negatively emaciating our children’s emotional resilience and it is up to us to change that. Losing is an incredibly valuable experience. Losing not only gives instant feedback on what players need to improve, but it also teaches children how to be humble and gracious. When children know how it feels to lose, they can both be proud of themselves for winning, but also feel empathy for the losing team. This will lead them to treat losing teams and players with dignity after each game. Ever see a team taunt the losing opponent? That’s a team that hasn’t learned how to win appropriately because they haven’t learned how to lose appropriately. Remember, losing doesn’t have to be about feeling like a failure. Instead, children should learn to think of losing as direct feedback on what needs improving. Kids need to learn how to assess why they lost, to evaluate how they should tweak their technique, teamwork, and communication, or learn if they need to support a specific player. Losing means that children experienced players and techniques that were better or more efficient. Instead of feeling miserable for losing, adults should coach students to look at losing as a way to LEARN. Take the loss as a challenge to study the winning team’s skills and then apply those skills to their own team. With this kind of mental rewiring, our children won’t need participation trophies, because they will completely understand why they didn’t “win” and know what they need to work on. For this to work, our mental relationship with “winning” and “losing” has to change. I totally agree with you, losing doesn’t feel good- but that bad feeling is motivation if channeled properly. Children will work harder and cultivate their skills because they feel driven. They want to win! This is where the adults play major roles in shaping children’s perspective and emotional relationship towards winning and losing. The adults need to constantly reinforce what it means to win- it means that all the players came to the game with their best effort, they communicated effectively, they followed the Coach’s directions and dominated their game. When a team or child loses, the adults need to have real conversations with them and let them know it is ok to feel angry or sad about the loss, but that they need to take those feeling as motivation to work harder for the next practice and game. Talk with your kids about where they think they can improve, or where they think their team needs support. Coaches must advocate that losing is a learning opportunity. After every game- win or lose, the team should meet to discuss what they learned from the game. What worked? What didn’t? Again, this is how life works so let’s be real with our kids. This “participation gets a trophy” mentality crosses over into the classroom too. Instead of assigning an A, B, C, or the dreaded F, we see no grades at all, just a check-mark. Once again, we hear this is to protect a child’s self-esteem. Children can’t improve without specific feedback on what needs improving. Teachers and parents should be generous with their feedback so children know where they need to work harder or where they need support. This feedback should be respectful, helpful and supportive. Simply avoiding evaluating student’s work doesn’t help them get better and it doesn’t prepare them for life. Children need to learn to accept feedback and learn how to implement it. When adults set age appropriate expectations, our children live up to them. One of the ways a child realizes that they need to do better is with a grade. I agree that in preschool or Kindergarten letter grades are not meaningful. In these cases, a red, yellow, green system of grading works could work. Make it clear what qualities earn each color so children can understand why they got the evaluation they did and what they need to improve to earn a higher evaluation. I’m not the biggest fan of grading children’s work with letters or color grades, but it is scaleable system and lots of schools use it. When children set goals for themselves, they take ownership over the process of achieving those goals. As parents and educators, we still need to be their bumpers so to speak, help keep them on the path, but children are incredibly capable and they should feel empowered to take ownership over their goals. Take the time to discuss your child’s goals for their class, team or hobby. Inquire and help form their study strategies and work habits. Talk with teachers to see if your child is doing their best or if tutoring is appropriate. Resilience isn’t something we can teach merely using words; it must be experienced. Winning and losing, success and failure, easy tasks and challenging endeavors all cultivate a resilient mind. Sport trophies and schoolwork feedback teach two important life lessons. First, that the amount of effort and work we put into an activity equals the amount of return. And second, no matter what we do in our life, we are always graded and evaluated. Sometimes those grades meet our expectations, while other times they signal we need to work harder or develop our skills. When we allow our children to struggle with difficult tasks and allow them to feel disappointed when they don’t win, we are giving them learning opportunities. They learn how to ask for help, problem solve, find more efficient to operate, and access what they need to improve. This is life and our kids can handle it. Let’s all commit to empowering our children’s resilience. This real-world approach to sports, school and life is how we combat low self-esteem and emotional fragility. We empower children to persevere through their challenges, to know they can accomplish their goals with hard work, and they when they lose, they have the opportunity to learn. As much as politically correct actions make us feel good and like we’re making the collective world better, we need to be forward thinking on which gestures we continue to implement. We need to ask ourselves- “Is this preparing my child for the world?” “Does this help my child navigate through our dynamic world with more skills?” Let’s not take the easy way as parents and educators. It is our job to prepare the future generations for the real world. The world we all know is full of winning and losing and successes and failures.